Ford (NYSE:F) has been a range bound stock for quite a while now. It pays out a 5%+ dividend yield which definitely can be increased with a clever options strategy. Listen here. I have been bearish on Ford (NYSE:F) stock for quite a number of years now especially when you consider where shares have declined from recently. Ford didn’t go bankrupt like General Motors (NYSE:GM) but the stock dropped to $1 a share back in the ‘great recession of 2008 & 2009. Even though management and bullish analysts will say that Ford’s production setup nowadays is far more streamlined now than before, this industry still requires the spending of an awful lot of money on factories and raw materials which means the ongoing upfront investment is still very large compared to most of the other sectors.. In saying this, Ford now states that it can basically turn off the tap with respect to its manufacturing which frees up a lot of cash flow. Dividend investors from the cash flow stance will favor the more streamlined Ford but is it enough ? In the auto sector, all of the companies rarely have strong competitive advantages which basically protect against downside risk. Advantages such as economies of scale, brand strength and pricing power are intangible assets that can keep a company’s margins strong in this sector over the long term. However I just don’t equate any of those afore-mentioned competitive advantages with Ford, which is why I’m always conscious of downside risk. In saying this, that’s basically speaking with my capital gains cap on so to speak as opposed to a dividend income generating stock. In fact from an income perspective, the stock definitely can’t be faulted over the last few years. Why? Well management has paid a special dividend annually plus the yield is presently well over 5% and although the stock is trading south of $12 a share at present, it has remained relatively range-bound. FRom an income perspective, although the stock has slowly grinded lower over the past few years, it still hasn’t pierced through $10 a share which is encouraging. So definitely from a dividend point of view, the stock can’t be faulted. Now if we take this one step further a lot of my readers will know that I like to trade options to boost dividend yields. To boost income in a stock like Ford (even though it’s not most volatile) can be done by consistently selling option premium against the long stock position every month or every 45 days. By careful management the five percent yield annualized can easily be bumped up to ten percent or even fifteen percent etc. 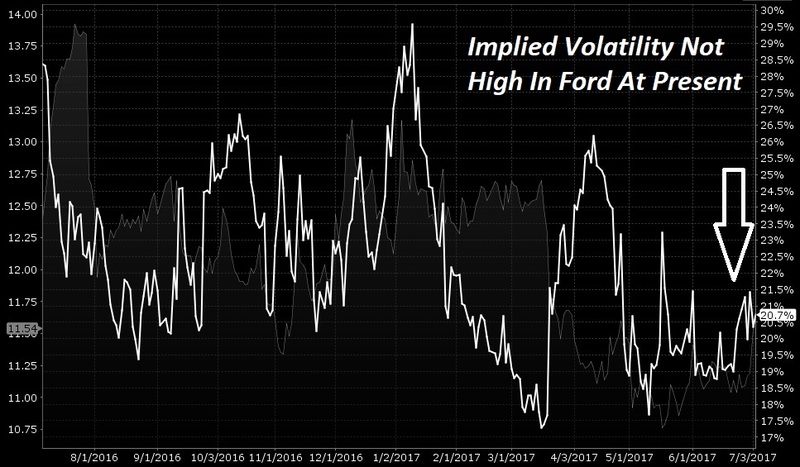 One just has to be wary when to sell premium because as I’ve said Ford is not the most volatile stock even though it does have strike prices which are half a dollar wide on some expiration dates. You don’t want to be selling too much premium at present when volatility is low because the money just isn’t in the options. So on a recent article I wrote, I discussed the possibility of selling an inverse Jade Lizard Strategy which is basically the combination of a a sold call option above the price of the stock and also the sale of a put spread below the price of the stock. As long as the total income received is more than the width of the strikes of the put spread, then there is no risk on this trade to the downside with respect to the option’s trade. Now, a trade like this in Ford has distinct advantages because one can place a stop loss, (something like 10% below the current price of the stock), which improves drastically the probability of success of the trade. The mindset here for the investor is to cap your upside so you can consistently make more money over the long term. A lot of investors have been long this stock for a good few years and are probably still underwater on their positions just collecting dividends along the way. However by adopting strategies like this or simply selling a cover call, one can drastically improve the dividend yield over time and improve the income that the investment can give you. So that would be my advice with relation to Ford. As I’ve said, I’m extremely conscious of downside risk in this stock. The CEO has just been changed, deliveries dropped five percent in June and we definitely have a cyclical top in the US market with respect to basically automobiles being sold (SAAR). Furthermore what should be monitored carefully in this stock is gas prices which are definitely helping the stock at the moment because Ford is still holding its own in relation to its SUV and truck sales. Free cash flows are still very robust and they are easily covering the dividend but this can change in a blink of an eye in a cyclical industry such as the auto industry. Therefore to take advantage of the range-bound nature of this investment, I would definitely recommend selling premium when volatility is high against long positions. This meaningfully increases the probability of success despite the possibility of losing your shares on a strong move to the upside. That’s smart investing and over time will definitely bring you in better returns. This is a mindset that I believe investors (especially with range-bound stocks) need to focus on which is basically capping your upside to improve your probability of success. Ford definitely in my opinion is a stock that is ripe for this type of strategy because I do not see it breaking out to the upside any time soon. This entry was posted in Ford and tagged (NYSE:F). Bookmark the permalink.